The introduction of online shopping heralded a notable fall in the number of high street shoppers for a while. But this looks set to change, as 2015 enjoyed a 40% increase in the number of weekly shoppers for high street stores. This is predicted to reach 44% in 2018. Why are customers returning to physical stores? It’s quite likely that the social act of shopping is becoming the main focus, rather than the act of purchasing. A lot of people are happy to head to the shops then order online after. So, how can retailers embrace this shift in focus? Could in-store technology be the key? We’ve teamed up with QUIZ Clothing, who offer a range of dresses in their online and high street stores, to see what impact in-store technology can have on the now-social element of shopping. Technology in the retail sector initially encompassed internet shopping, with many brands offering an online store. But, recent research still indicates that people value brick-and-mortar stores — in fact, 81% of UK customers said that the physical stores were vital to the shopping experience. So, when it comes to improving the high-street and implementing in-store technology, what should retailers be getting involved with? Kiosks that make use of artificial intelligence are a hit with many customers. However, not all retailers are getting on board — 66% of those surveyed in one study said that they were yet to encounter artificial intelligence in-store. Do retailers realise the huge potential of this type of technology? In fact, 60% of consumers are attracted to the idea of using them to find products that they weren’t aware of before. As an example, in QUIZ’s digital stores, an in-store kiosk enables visitors to browse the full collection (even if some products aren’t available in-store) and order them to their homes or local store. Technology can also support staff in their efforts to assist customers. One way to do this is by providing employees with handheld iPads or other smart tablets. This allows staff to find the answer to a query, check a product’s availability and place orders for the customer without having to use a fixed computer. This can improve the customer’s experience and help build a stronger brand-to-customer relationship. A relatively new form of technology, augmented reality is one to look out for! This can help the customer with their purchase decision and help them visualise themselves with the product. Although this can be made available through an app, there are also ways to introduce it in-store. In a fashion store for example, a smart mirror can allow customers to dress themselves in different outfits without actually trying them on. Similarly, in a furniture store, visitors can upload a photo of their home and try out pieces of furniture to see if it would suit their rooms. In-store technology, when used correctly, can be a powerful reflection of your business. It’s possible that having in-store technology in a physical shop can make a brand more attractive to customers, and potentially a better option over competitors. Some retailers are recognising this too as one report suggested that 53% of retailers view investments in new automations and appliances in-store as vital to keep up with their competitor activity. A customer’s experience can be embellished by in-store technology. One study revealed that 46% of those surveyed said that a positive experience due to well-functioning technology increases their brand confidence. Technology can suffer set-backs like crashes and failures. This can be frustrating and add time onto a customer’s visit which may result in a negative experience. In fact, RetailWeek found that two thirds of those surveyed had experienced problems and breakdowns in-store with the technology. Unfortunately, this then affects sales — one third of customers said that they were unable to complete their transactions because of the technology difficulties. Just like anything else in a store, the technology within it represents the brand and a poor performance can look bad for the company. Retailers must keep software and technologies updates and well-maintained to avoid issues like this. If your technology is too over-complicated, this can reflect badly too. This could make people feel excluded too — in-store tech should be simple to use, and visitors should be accompanied when using it if it’s more complex. 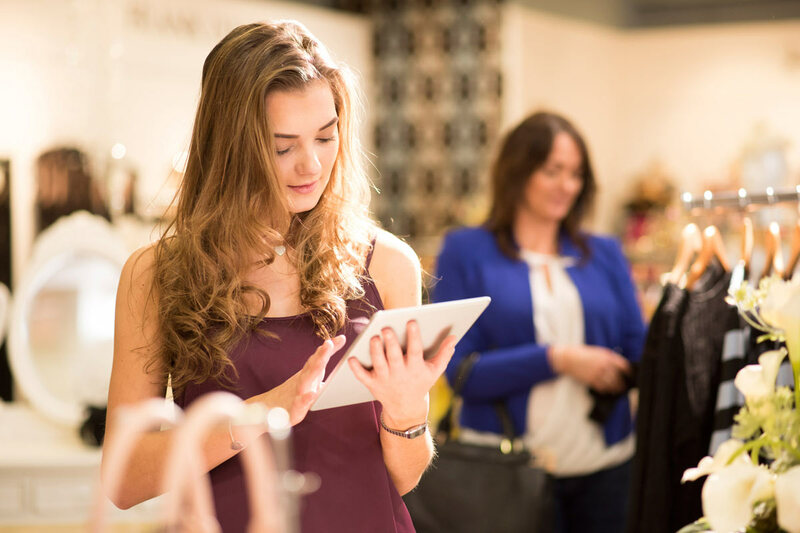 Technology in-store is becoming a staple necessity to success on the high street. Although customers are happy to shop online, they also enjoy shopping as a leisure activity and appreciate an interactive experience when doing so.